Synopsis- An orphaned boy brought up to serve the state as a man. A rich young woman incapable of living by the conventions of society. Neither is prepared for the journey into the heat, mystery, violence and disorienting perpetual daylight of the far North. But the Minister has more than a professional tie to Magnus, and at the last moment, he adds another responsibility. Disgusted by the wayward behaviour of his daughter Lovisa – Magnus’s sister-in law – the Minister demands that Magnus take her with him on his arduous journey. Thus the two unlikely companions must venture out of the sophisticated city, up the coast and across country, to the rough-hewn religion and politics of the settler communities, the mystical, pre-Christian ways of the people who have always lived on this land, and the strange, compelling light of the midnight sun. 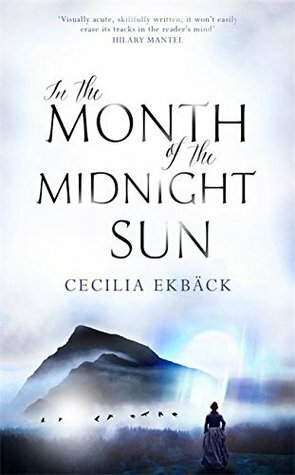 Review- In the Month of the Midnight Sun is the second historical Nordic Noir thriller by Swedish author Cecilia Ekback. Her debut novel, Wolf Winter was one of my favourite reads of 2015, so when I had the opportunity to read her new release (set 150 years later in the same setting) I was very excited! She’s a brilliant writer and creates a character-driven and intricate plotted murder mystery that keeps you guessing until the very end. It’s 1855 in the Swedish Lapland’s Mountains and three men have been massacred. An indigenous man is in custody but refuses to talk. The Minister of Justice in Stockholm sends his son-in law Magnus, a geologist along with his exiled daughter Lovisa (and Magnus’s sister in law) to investigate and check on the Mountain resources. Once again, the Mountain is the star of the novel, it takes on a character in itself and creates an eerie backdrop to the intrigue of the murder mystery. Unlike Wolf Winter, this book is set during summer; known as the month of the midnight sun and so the heat creates an atmosphere amongst the people where frustrations simmer just below the surface. Magnus is an interesting character whose past begins to emerge as he finds himself feeling at home in the mountains, while Lovisa redefines her identity without the disapproving observations of her father. Their meeting with settler and older Lapp woman Ester, initially fraught with distrust draws them together to uncover the mystery of the murder and the horrific tragedies that have been buried in the Laplands. I won’t go too much into the plot; it’s really one of those stories you just have to read and experience for yourself. And in many ways when describing the plot it doesn’t seem like much really happens, but Ekback manages to make a lot happen without having to say much. I like that she allows the reader to read between the lines and discover things rather than being spoon-fed the clues. Fans of Burial Rites will enjoy this one. Another great thriller and this author is definitely one I will seek out again in the future.